Trekking and Climbing in Venezuela. 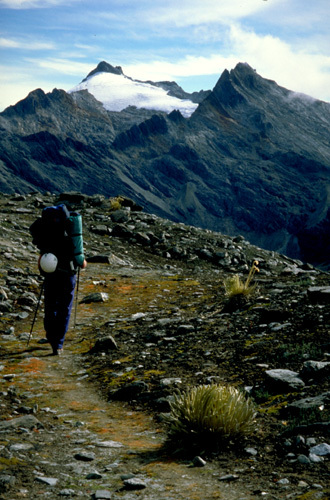 The highlight of this trekking and climbing expedition is a traverse of the Sierra Nevada de Merida, Venezuela's highest and most spectacular mountain range. We'll make two ascents from high camps near this ridge, Pico Humboldt 4942m which is a fairly easy snow climb and Pico Bolivar 4979m, which is a difficult rock scramble and Venezuela's highest mountain. Both ascents are entirely optional and the trip would also be suitable for those who just want to enjoy the spectacular walking along the spine of the Sierra Nevada. We'll be based in the pleasant university city of Merida at the foot of the Sierra Nevada, from where the worlds highest cable car provides quick and easy access to the mountains. From Merida we'll also make a short acclimatisation trip to the Sierra de la Culata (a.k.a. known as the Sierra del Norte) before the main one week trip to the Sierra Nevada. Pico Bolivar north face from the walk up El Toro. Merida is a small and pleasant city situated in a deep forested valley in the Venezuelan Andes at a height of 1600m above sea level. The Sierra Nevada de Merida rise over 3500m immediately to the south of the city and there are spectacular views to these snow covered peaks. 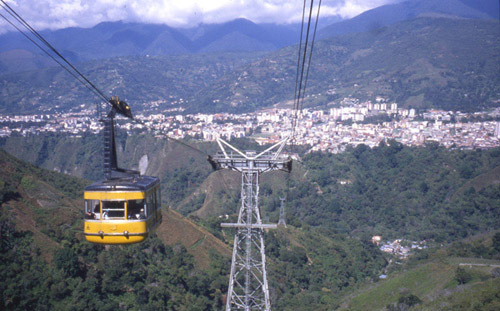 A cable car connects the city centre with Pico Espejo 4768m. It is claimed to be the world's longest and highest cable car and we will travel as high as possible on it to access the mountains. The first phase of the expedition will be a series of day walks and then a short two night trek in the mountains of the Sierra de la Culata (Cordillera del Norte), which lie north of Merida and face across to the Sierra Nevada. We'll aim to climb as high as 3500-4000m on these walks to gain valuable acclimatisation for the main traverse. 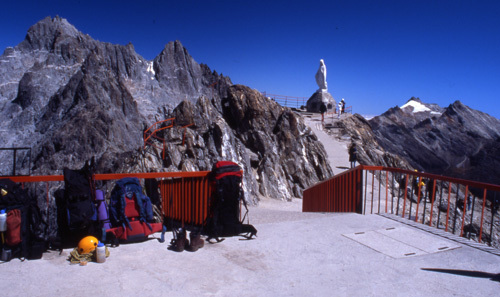 For the fittest it is possible to ascend the peak of Pan de Azucar 4690m for a first spectacular view of the Venezuelan Andes. 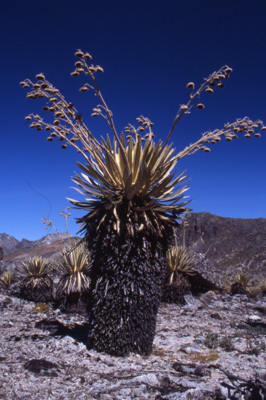 All the high peaks of the Sierra Nevada de Merida are in a national park which was founded in 1952 to protect the unusual flora and wildlife in this part of Venezuela. The wildlife keeps itself well hidden but the unusual flora is easily seen. In the valley bottom banana and sugar cane grow, higher up above 2000m is a zone of pristine rainforest with towering hardwood trees, lianas, ferns and bromeliads. Higher still around 3000m is a bamboo and tree-fern forest which then gives way at 3500m to the 'paramo' a moorland of giant heathers, alpine flowers and the strange espeletia plants which look like alien visitors! This is an outline of our planned daily schedule for the high level traverse of the Sierra Nevada, obviously subject to change due to weather, route conditions, etc. Day 1 -- Cable car access to the Loma Redonda station and short walk to a campsite. Day 2 -- Ascent of Pico El Toro, an easy scramble. Day 3 -- Cable car access to Pico Espejo and walk to Laguna Timoncitos 4700m, at the base of Pico Bolivar. 2 hours walk with packs, some exposed scrambling. Day 4 -- Ascent of Pico Bolivar 4979m and backpack to Laguna Suero 4200m, through La Ventana pass, mostly downhill. Day 5 -- Ascent of Pico Humboldt 4942m. Second night at Laguna Suero. Day 6 -- Descent from Laguna Suero via Laguna Verde to La Mucuy, 2500m descent. Approx. 15km with packs, entirely downhill. This expedition is ideal for anyone with some hillwalking or trekking experience, but could be joined by fit and adventurous people with no previous experience. Previous experience of rock scrambling or climbing will be a big advantage for those wanting to take the optional climb of Pico Bolivar as there is rock climbing at up to V.Diff (about 5.2) standard on the route. Reasonable mountain fitness is required to make the most of this expedition and some recent experience of backpacking is recommended as we will have to carry our own full camping/climbing rucksacks (15-18kg) on the main ridge traverse (only for three short and/or downhill days!). In Venezuela, even in the dry season, we will probably have a few rainy afternoons - it can also be chilly at night at altitude. Expedition members should be able to work as a team when it comes to helping pitch tents, etc. There will be some freeze-dried and lightweight food in many of the meals on the main traverse. In the mountains we will be backpacking, with 15-18kg rucksacks. However these days will be kept short or (on the long last day) are downhill only. We travel to Venezuela early in the dry season, but it is quite likely we will get afternoon showers and thunderstorms. Mornings will normally be clear and bright. In Merida the climate is warm and spring like, but higher in the mountains it will be cold out of the sun and at night, with temperatures dropping below freezing above 4500m at night. All clients must be insured for medical costs and repatriation in an emergency. We recommend having insurance for baggage, personal liability and cancellation as well. If you would like further advice please ask. Venezuela is a relatively well developed country and the standard of health and hygiene is generally reasonable. You would be unlucky to get an upset stomach or diarrhoea, but it is possible. Vaccinations for tetanus, typhoid, yellow fever, hepatitis and polio are recommended. Venezuela suffers from a bad reputation for theft and insurance is a necessity. It has to be said that thieves steal from easy targets; most tales of theft involve the victim doing something unwise. It is important to stay alert when in busy public areas and to guard your belongings carefully at all times. Muggings and other violent crime are very rare. We will issue further advice to all clients before departure. Driving, hotels and general safety : In Venezuela driving, fire safety standards and general safety standards are not as high as in Europe. Crime : Venezuela has a higher crime rate than Europe. As a wealthy tourist you may attract attention. Minor slips and falls : due to steep, uneven and unstable ground, logs and slippery vegetation. Remoteness : You will be up to two days walk from professional medical help for periods of time. There is almost no chance of a helicopter rescue. Mountain Hazards : In certain places you may be subjected to a slight risk of rockfall. 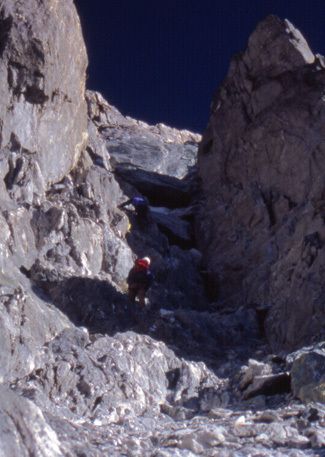 Sections of the itinerary involve exposed scrambling, which although easy would have serious consequences in the event of a slip. There are also slight risks from bad weather. 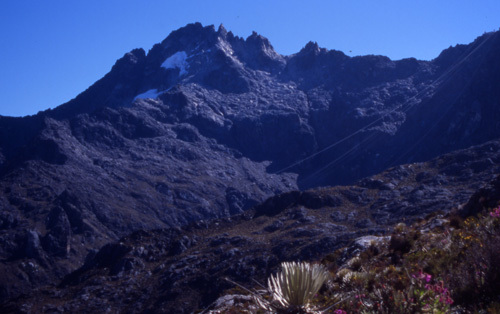 On the ascent of Pico Bolivar there is a generally higher risk of rockfall, for which a helmet must be worn, plus potential hazards from abseiling, climbing and being caught out by bad weather. Our expeditions are designed to be small and flexible. The expedition will be co-ordinated, organised and lead by us, but as far as possible will adapt to the plans and aspirations of the members. We will consult you when planning the details of the expedition. We publish an outline itinerary so that we have something to fall back on if none of us can agree! Please note however that the leaders decision is final where the safety of the group or any member is in jeopardy; for example where retreat or diversion is necessary due to illness or bad weather. Due to the terrain this is not a supported trek; in the mountains we will be backpacking, with 15-18kg rucksacks. However days will be kept short or (on the long last day) are downhill only. The minimum number of customers we need to run this expedition is three. The maximum size of the expedition will be four customers plus leader. In some circumstances we may be able to run the expedition with just two members and a local leader.